Masahiro Tanaka struck out six over seven solid innings, outpitching Hisashi Iwakuma to help the Yankees defeat the Mariners, 4-3, on Sunday at Yankee Stadium in the first Major League meeting between a pair of former Japanese teammates. Tanaka limited Seattle to three runs (two earned) and six hits over seven innings without a walk, with New York taking the lead as Brett Gardner scored on Iwakuma's fifth-inning wild pitch. Tanaka and Iwakuma were teammates on the Tohoku Rakuten Golden Eagles from 2007-11. "I barely saw it," Gardner said of the wild pitch. "I think it went maybe between his legs and the umpire's legs and I could barely see it behind them, but I knew it got behind them enough that I could score. It was a split-second decision and it worked out." 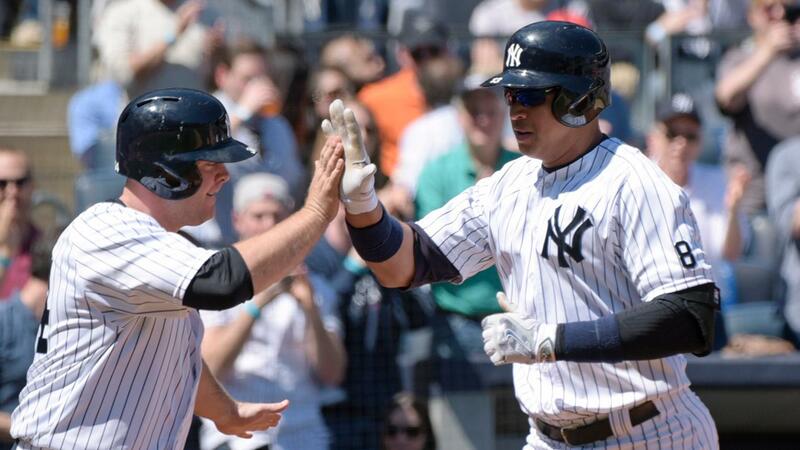 Alex Rodriguez hit a two-run homer in the second off Iwakuma, snapping an 0-for-19 skid. It was Rodriguez's second home run of the year and the 689th of his career. Iwakuma permitted four runs and seven hits over seven innings. The Mariners missed a chance to sweep their first three-game set in the Bronx since 2002 as they dropped to 5-7. But manager Scott Servais was glad to win the series and get a nine-game road trip off on the right foot after going 1-5 at home. "The key is to win the series, no doubt," Servais said. "It would have been nice to sweep here. I think we're playing much better, obviously, then we played at home. But yeah, win the series, get a day off [Monday] and then go get Cleveland." "I think it was important," Yankees manager Joe Girardi said of the home run. "It's frustrating when you're struggling. No matter how good of a player you've been, no matter what time of the year it is, you can be hitting .330, if you go 0-for-20, it's frustrating." Hey, I'm here, too: Not to be overlooked in the battle of Japanese pitching standouts, Mariners leadoff hitter Norichika Aoki made his mark with a one-out triple in the fifth as his low liner to center eluded a diving Jacoby Ellsbury and rolled to the wall. The 34-year-old outfielder from Tokyo then tied the game at 3 as he scored on Seth Smith's single up the middle against a drawn-in infield. Wild card: The Yankees continued to have issues with runners in scoring position, though Gardner cashed a run-scoring double in such a situation in the third to bring home Ellsbury. New York grabbed another run from scoring position, although it didn't come off a hit, but an Iwakuma wild pitch. Gardner provided the theatrics, scampering home on the loose ball and scoring what ended up being the go-ahead run. You gotta get 'em early: The Mariners missed out on their opportunity to bust things open against Tanaka in the first after they loaded the bases with three straight one-out singles by Smith, Robinson Cano and Nelson Cruz. Seattle pushed a run across on a fielder's choice grounder by Kyle Seager, but Tanaka slammed the door by striking out Adam Lind and then held the Mariners to three hits over the next six frames. "We had an opportunity there," said Servais. "You want to get out there early. We got one run across, but obviously we're looking for a little bit more. We had a few chances today, but Tanaka pitched a good ballgame as well. It was a tight one the whole way, we just came up a little short." The matchup between Iwakuma and Tanaka marked the first time that a pair of Nippon Professional Baseball teammates have faced each other in the same Major League game. Tanaka and Iwakuma played together with the Tohoku Rakuten Golden Eagles from 2007-11. First pitch was at 2:09 a.m. Japan Standard Time and the game was televised nationally in Japan. Sunday's contest also marked the 12th time that a pair of Japanese-born starting pitchers have linked up in a big league game. The most recent example was June 25, 2013, when the Yanks' Hiroki Kuroda faced the Rangers' Yu Darvish in the Bronx. The Mariners are 8-3 in their past 11 games in the Bronx since 2013 and have outscored the Yankees, 56-27. Mariners: After their third off-day this month, the Mariners continue their road trip Tuesday at Cleveland with a 3:10 p.m. PT game at Progressive Field. Wade Miley, looking for his first win for Seattle, faces right-hander Carlos Carrasco in the opener. Miley is 0-1 with an 8.25 ERA in two starts, both coming against the Rangers. Yankees: Following an off-day Monday, the Yankees open a three-game series with the Athletics on Tuesday at 7:05 p.m. ET at Yankee Stadium. Right-hander Michael Pineda (1-1, 6.55) makes his third start, coming off a loss in a quality start against the Blue Jays. Left-hander Eric Surkamp (0-1, 4.00) draws the start for Oakland.